The Old Lyme Land Trust held its 52nd Annual Meeting at the Lymes’ Senior Center on Sunday, March 18. Attendance was the largest in the Trust’s history. The meeting was highlighted by an informative and entertaining presentation on bobcats in CT. The program, “The Bobcat: Connecticut’s Secretive Wild Cat” was presented by Master Wildlife Conservationist, Paul Colburn. He discussed the natural history of bobcats in Connecticut and provided an overview of bobcat habitat, diet, behavior, reproduction, and current research efforts. Colburn encouraged the audience to report bobcat sightings to the state Department of Energy and Environmental Protection (DEEP) at deep.wildlife@ct.gov. 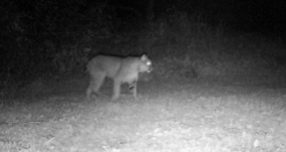 The image at left was captured on a trail cam by an Old Lyme resident. Bobcats, lynx rufus, are the state’s only wild cat and have been sighted in almost every town in the state. The bobcat was once hunted for both its fur and bounty payments, but is now protected. and the current population is estimated at 1500 to 2000. Even though bobcats can catch and kill a deer, they are shy of humans. In the business portion of the meeting, the Trust honored Lea Harty as the Volunteer of the Year. She is the former Trust secretary and still edits and produces the Trust’s Annual Letter, Tributaries. She has organized work crews to eliminate invasive burning bush on the Jericho Preserve and will soon lead another crew to plant native shrubs at Watch Rock. Trust President Michael Kiernan announced that the newly acquired 11-acre “Denison Farm” parcel is now fully accessible through the trail system on the Upper Three Mile River Preserve. He also announced receipt of a $36,000 grant toward the purchase of Denison from the state DEEP’s OSWA grant program. The Trust conducts regular work parties to maintain its 14 preserves; volunteers are always welcome to participate. In other business, Mary Devins and Sabine O’Donnell were elected to the board of directors. The Old Lyme Trust reminds LymeLine readers to visit the Trust’s display at the Midsummer Festival on Saturday, July 28. Meet some of the local wildlife (the non-human kind!) that make their homes in the Trust’s preserves. Raptors, reptiles and a variety of insects will be looking forward to meeting you.